Tuesday June 27th 1893 I put the clothes out early and then went over the river and stayed most of the day. I took the clothes down and got the supper after I got home. I helped Mother put up cherries. 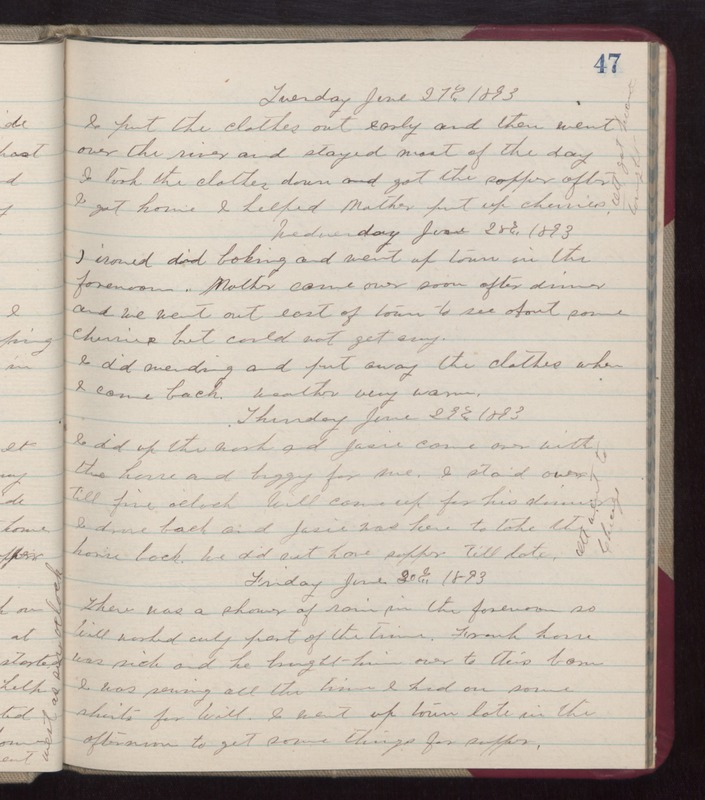 Wednesday June 28th 1893 I ironed, did baking, and went up town in the forenoon. Mother came over soon after dinner and we went out east of town to see about some cherries but could not get any. I did mending and put away the clothes when I came back. weather very warm. Thursday June 29th 1893 I did up the work and Josie came over with the horse and buggy for me. I staid over till five oclock. Will came up for his dinner. I drove back and Josie was here to take the horse back. We did not have supper till late. Ott went to Chicago. Friday June 30th 1893 There was a shower of rain in the forenoon so Will worked only part of the time. Frank horse was sick and he brought his over to this barn. I was sewing all the time I had on some shirts for Will. I went up town late in the afternoon to get some things for supper.